Enjoy our natural retreat with the south-facing terrace or a cozy evening by the fireplace. Do not feel like deer? Drive in just 10 minutes to Lübeck or shopping in Hamburg. Experience our newly refurbished holiday cottage located in the countryside and yet only a stone's throw from the center in Bad Schwartau is removed. Look forward to the sunny south facing terrace overlooking old houses and a cozy fireplace for cozy evenings in the cold season. Our guests have a modern kitchen, a flat-screen TV with DVD player and a fireplace. In addition, you get with us also bed linen and towels. Bad Schwartau is a nationally recognized Jodsole- and mud baths. Enjoy a moment of relaxation on long walks in the natural parks or visit the Holstein Therme. The small holiday house shares the property with our tenement house, where a family lives. As the holiday cottage is fully self contained, and the necessary peace and privacy. The location is close to nature yet centrally. All around, everything is green, you may encounter on the property once a deer or pheasant. Squirrels and rabbits running a constantly on the road. In the forest knocking the woodpecker, while the cuckoo calls. In the summer dragonflies flit across the yard and seem to look after things. Nowhere in Bad Schwartau you will be more beautiful aroused in the warm season than right here, because the forest birds have stunning wake up call. Or a pair of ducks waddling across the lawn and quacks to himself. "Indian Summer" by the way, we can also: The trees of the forest in autumn shine in all facets of yellow and gold. Then sometimes a raven conference held in the old oak tree next to the cottage. And yet it is only a few steps through the park and is in the middle of the pedestrian zone Bad Schwartau or at the mall P1. A car is needed as well as not. Unless you want this heavenly oasis but leave time! Then you can in just 3 minutes drive onto the A1 and from Hamburg or Travemünde or Fehmarn "abdüsen". You can reach a total of 4 different bus stops just 400m away from the hotel and the train station of Bad Schwartau is only about 2km away. In the cottage there is a shower with only about 30 cm narrow entrance. 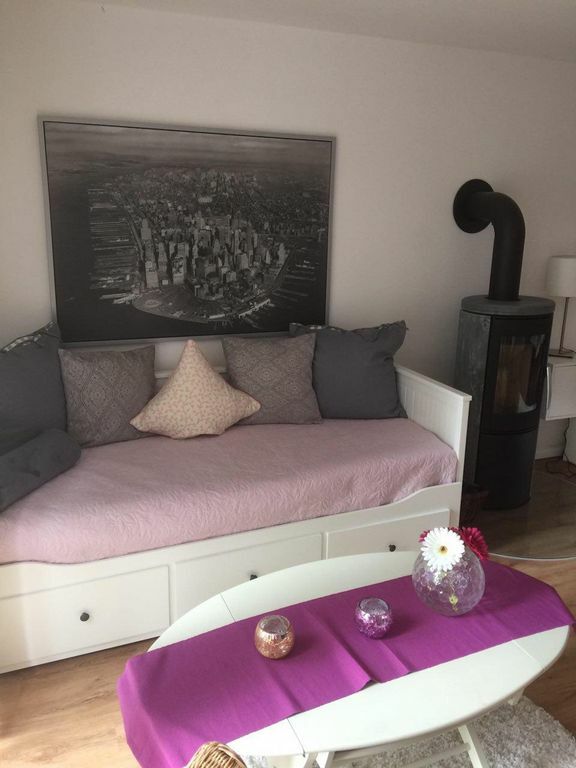 sehr modern eingerichtete Ferienwohnung (mit allem was das Herz begehrt) in ruhiger Lager und trotzdem zentral gelegen. Lübeck direkt vor der Tür, Travemünde und Timmendorf ebenfalls direkt vor der Tür. Ganz klare Weiterempfehlung!!! Var kanon, kunde varit bättre ventilation, blir varmt om natten. Går att öppna men är rikligt med mygg. Sauber, zweckmässig, sehr ruhig, unkompliziert! Hat Möglickeiten, sich zu verbessern. Ruhige Lage, in naturnaher Umgebung. Wohnung ist gut ausgestattet, besonders hervorheben sollte man die moderne Küche, Backofen, Induktionsfeld, Mikrowelle Unfalles andere, was man braucht. Auch die Internetverbindung sehr gut. Fernsehen über Internet ist kritisch zum sehen: Auch wenn man die Bedienung begriffen hat, gibt es Macken: Minutenlange Unterbrechungen durch "Nachladen", manchmal ist Neustart nötig. Auch die Terasse würde sehr gewinnen, wenn man einen Sichtschutz (einfaches Holzgeflecht) hätte, ohne sitzt man doch sehr auf einem Präsentierteller. Die Wohnung ist klein aber oHo... Wir waren mit 4 aktiven Mädels unterwegs in Lübeck und haben in der Wohnung übernachtet. Frühstücken ist an dem Tisch kein Problem, gekocht haben wir allerdings nichts, wenn auch die gesamte Ausstattung für einen Weiberausflug gereicht hätte. Der Fernseher ist von allen "Liege"plätzen (Bett und Sofa) sehr gut für Mädelsabende einsehbar. Nach Lübeck ist es nicht weit zum shoppen ebenso wie zum Timmendorfer Strand oder nach Travemünde. Ein rund um gelungenes Wochenende in ganz gemütlicher Atmosphäre. Ruhige Lage. Für 4 Personen am Wochenende okay. Für einen längeren Zeitraum nur für 2 Personen geeignet.